Can you add ‘BES Custom Sites’ if you haven’t done that already? I have a new version to support BES Custom Sites. I will send you a copy for testing. I have added the ability to save the queries, and also export them. Computer Groups filter is added only for BES Computer. All the date/time are now reformatted so that they can be sorted in Excel. I will send you a copy for testing. Thanks for the ideas. Need Help: I have a need to report on members of custom sites. Previous administrators added machines to some custom sites that should have been. Example: We have a custom site for specific machines and when reviewing applicability to Custom fixlets published in this site, I am finding the applicability numbers being skewed. I need to identify those machines in order to target them for action. I noticed in previous posts that this feature was discussed, but not implimented? I have included Custom Sites in version 3.1. It needs additional testing, and I will send you one to see if fits the bill. I’d like to second the proposal for Computer Groups. Not as much as an attribute to download (although that would be nice, I can see how it could be problematic as a computer can be part of multiple groups) but particularly as a filter criteria. It’s hard to get data that makes sense to the business without it. Also, can you wildcard in the filter? If so, what is the character? * doesn’t seem to work. And, while I’m asking for the moon, is there a way to do group and count? For example, in the 7.2 web interface you could get a list of all the installed applications and the count of how many computers each applicaiton was installed on (which you could also filter by group). I can’t seem to find a way to do it in the new 8.0 web interface, but this excel plug-in does almost the same thing. To get back to where I was in 7.2 I’d need computer group filtering and the ability to summarize counts of a particular return value. I can probably do some of this manually in Excel, but since you’re taking requests, I thought I’d ask. There are no wildcards in relevance query, but you can use “contains” to get around some statements. There are wildcards for files and folders to be precise. Counting makes sense for one property. This is interesting and I will think about adding this next time. Per my previous post, I have added Computer Group filtering for BES Computer, not the other object at the moment. 00:06:31 Starting the add-in registration process. 00:06:31 Calling GetInterface method for the CorRuntimeHost interface. 00:06:31 The CLR v4.0.30319 has been initialized successfully. 00:06:31 Creating a new domain setup. 00:06:31 Getting the add-in directory. 00:06:31 The ‘shadow copy’ is disabled. 00:06:31 Creating a new application domain. 00:06:32 Getting the base directory for the domain. 00:06:32 Success. The directory is ‘C:\BigFix Excel Connector’. 00:06:32 Searching for the Add-in Express core library. 00:06:32 Success. The ‘AddinExpress.MSO.2005.dll’ file is found. 00:06:32 Creating an instance of the ‘AddinExpress.Deployment.ADXRegistrator’ class. 00:06:32 Assembly identity is ‘AddinExpress.MSO.2005’. 00:06:32 Unwrapping the instance of the ‘AddinExpress.Deployment.ADXRegistrator’ class. 00:06:32 Calling the managed registration procedure. Exception Message: Wrong command line. 00:06:32 The add-in registration process is completed with HRESULT = -2147467259. 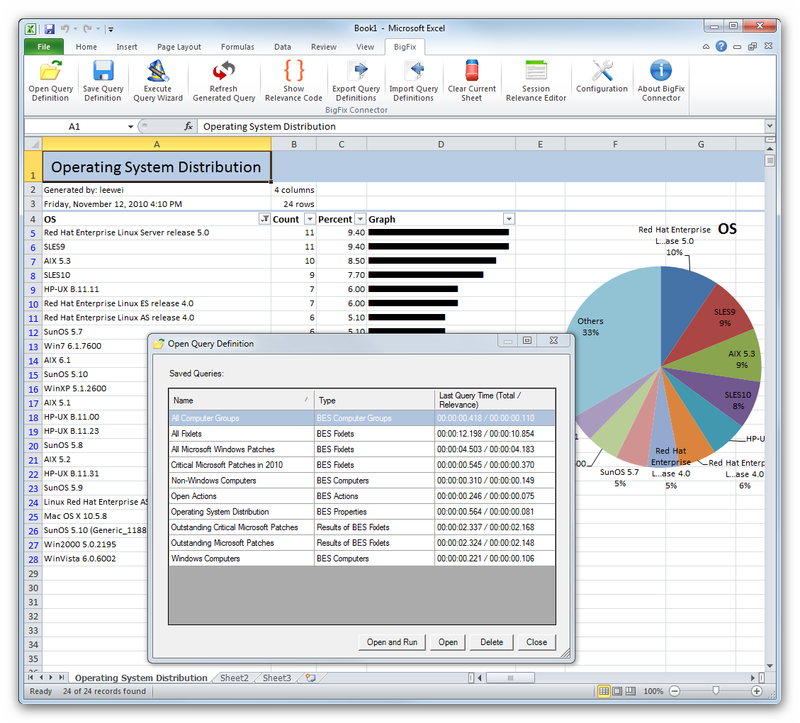 Are you still using Excel 2010 x64? I did not compile the add-in for 64-bit Excel, so I do not know if this is supposed to work. I will work with you to investigate this when I am able next week or so. Yes, i’m still trying to use Excel 2010 64bit. I can wait for a supported version, just figured it would be way easier to use then the web reporting. Love to the tool it’s very powerful and great for generating charts and data to show upper manamgement. I’ve noticed an issue when using the BES Computers inspector. If you add the subscribed sites attribute to your result list it dosen’t appear to list any custom sties the computer is subscribed to. We use custom sites to deterimine which department owns a particular workstation so breaking up reports based on department can be difficult with out this attriubte. I also think something that would be beneficial for the community would be the ability to save a query you have created using the excel connector so you can go back in the future and run the same report with out having to select the attriubtes and filter all over agian. Regarding the subscribed sites property, I believe this issue is fixed in version 8.0 of BigFix. In 7.2.5, it seems to omit any custom sites. This is the BigFix Server and not the Excel Connector via the SOAP API. If you use this statement, you can see that for a given computer, the custom sites are missing. I have verified that version 8.0 fixes the issue. I have a new version that can save reports. I will send you a version for testing before I release it. We are running BigFix version 8 but it still dosen’t seem to return any custom sites for the Subscribed Sites Property. The updated connector for the saved queries appears to be working great however. Private messaged with murtasma. He misread the output, it does contain the subscription for custom sites. I have recorded these clips to show some features. I have seen a few instances where people are having problems extracting Computer Properties because there are duplicate names. For example, if you create a Retrieve Property call “OS”, that will work correctly, but there is a potential of conflict against the default “OS”. So I have fixed the Excel Connector to use explicit IDs. I have also added special filters to “Free Space on System Drive”, “RAM”, and “Total Size of System Drive” properties so that we can sort them by integer sizes. By default, they are returned as string with the trailing “MB”. This makes it difficult to sort in a meaningful way. 14:36:10 Starting the add-in registration process. 14:36:10 Calling GetInterface method for the CorRuntimeHost interface. 14:36:10 The CLR v4.0.30319 has been initialized successfully. 14:36:10 Creating a new domain setup. 14:36:10 Getting the add-in directory. 14:36:10 The ‘shadow copy’ is disabled. 14:36:10 Creating a new application domain. 14:36:10 Getting the base directory for the domain. 14:36:10 Success. The directory is ‘C:\BFConnector’. 14:36:10 Searching for the Add-in Express core library. 14:36:10 Success. The ‘AddinExpress.MSO.2005.dll’ file is found. 14:36:10 Creating an instance of the ‘AddinExpress.Deployment.ADXRegistrator’ class. 14:36:10 Assembly identity is ‘AddinExpress.MSO.2005’. 14:36:10 Unwrapping the instance of the ‘AddinExpress.Deployment.ADXRegistrator’ class. 14:36:10 Calling the managed registration procedure. 14:36:12 The add-in registration process is completed with HRESULT = 0. Still I get no add in. I’m running windows 7 x64, Office 2010 32bit. I tried running on a 32bit XP virtual with office 2003 installed, also no luck. I feel like there is just something simple I’m missing, but I’m not seeing it. Any advice? Did you try right-click on the setup.exe and “Run as administrator”? 09:01:55 Starting the add-in registration process. 09:01:55 Calling GetInterface method for the CorRuntimeHost interface. 09:01:55 The CLR v4.0.30319 has been initialized successfully. 09:01:55 Creating a new domain setup. 09:01:55 Getting the add-in directory. 09:01:55 The ‘shadow copy’ is disabled. 09:01:55 Creating a new application domain. 09:01:55 Getting the base directory for the domain. 09:01:55 Success. The directory is ‘C:\Program Files (x86)\BigFix Enterprise\BigFix Excel Connector 3.2’. 09:01:55 Searching for the Add-in Express core library. 09:01:55 Success. The ‘AddinExpress.MSO.2005.dll’ file is found. 09:01:55 Creating an instance of the ‘AddinExpress.Deployment.ADXRegistrator’ class. 09:01:55 Assembly identity is ‘AddinExpress.MSO.2005’. 09:01:55 Unwrapping the instance of the ‘AddinExpress.Deployment.ADXRegistrator’ class. 09:01:55 Calling the managed registration procedure. 09:01:55 The add-in registration process is completed with HRESULT = -2147467259. (same problem jstarkey posted in October). I’m on a 64bit windows 7 box, UAC is disabled. I found a post on a similar topic on another website advising regregistering atl.dll. Didn’t think it would work, but I ran it any way. I was right, it didn’t seem to do anything. About the only other thing I can think of is that VisualStudio 2010 is on-box. This shouldn’t cause any problems, but it’s another vairable, i suppose. And I have found a (the?) solution. More info. For giggles, I tried to manually add the com plugin from excel by going to addins-> manage com->add…->c:<install point>\adxloader.dll, i received an error indicating excel wa already open. I could not dismiss the error, and had to end excel from task manager. On a hunch, I opened Word, followed the same process, and received no error. Once I had added the dll in word, I launched excel, and the connector was installed and operational. I’ve been using this for a while, and it’s definitely a killer app… it’s often more useful than Web Reports. I sent you a private message a few days ago but did not hear back. I was hoping to help you troubleshoot the install, but glad you got it working.